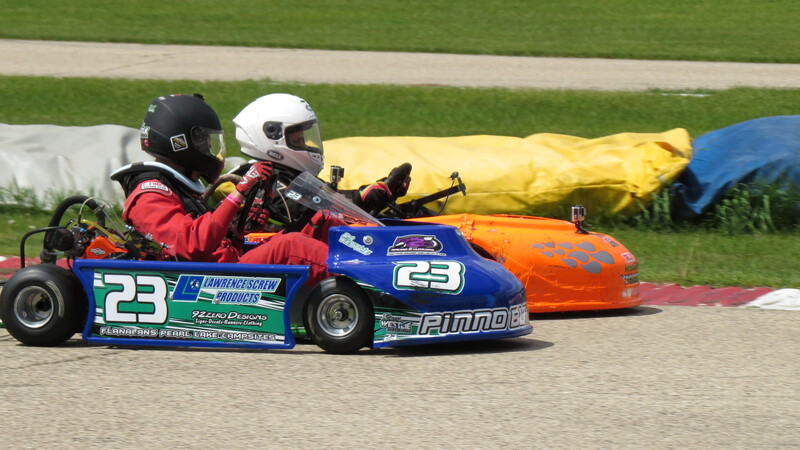 This weekend was the second race weekend of the Mid-American Sprint Series at Badger’s Briggs and Stratton Raceway Park. We arrived Friday evening to do a simple camp setup. It was too late in the day to get any practice in, never mind the fact that it was nearly freezing. Every kart racer should have a notebook with details on kart setup and kart performance for each race and practice session run. Things like gearing, tire pressure, castor, and lap time and max rpm. This makes it easy to get a kart ready for a race ahead of time and will give you more time for fine tuning during practice. I have a notebook that has pretty good notes and I check it before every race. However, I apparently don’t believe everything I read. I didn’t follow my notes this weekend and the setup was not accurate. This would have a detrimental effect on the weekend’s racing, with added cold, wind, and snow. Our friend Robert came out on Saturday morning to help us with a bit of coaching. His dad, Marty, also gave me some tuning advice. The days temps were not expected to reach much above freezing, and there where light flurries before and during practice. 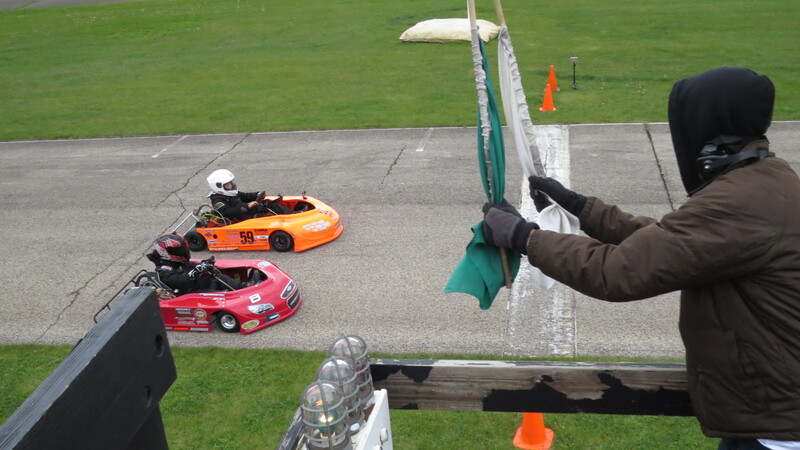 Jason took to the track but could not get the kart to turn to the right and reported general handling awfulness. Robert and I struggled to find the cause and find the setting to get the kart to hook up on the track. Jason and Robert did try to work on his racing line and set some goals for when the kart did start working, if it started working. During qualifying, the right nerf bar broke, which would have put us out of the race. But once again, Marty saved us and welded it up just in time for the pre-feature, where Jason took third. We eventually found the problem with the kart; the rear wheel spacing was not set correctly. The left wheel was set 1/2 inch too far out and the right wheel was 1/4 inch out and the castor was 0 instead of -2. The settings were in my notebook (sigh). This would cause the kart to not turn right and have generally poor handling. 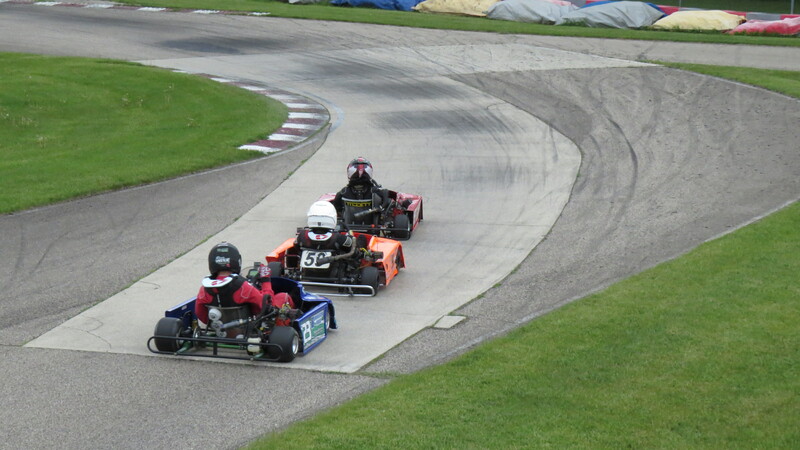 Even then the kart was still a handful to get through corners due to the cold tires and track. The Feature was actually very exciting with Jason putting on a great show with a Junior driver and a sportsman driver, all three fighting for the same position. Each of them working together and against each other using bump drafting trying to get the advantage. Eventually, Jason found it and made some great front straight passes to take a very well earned second place. Jason turned 11 while he was on the track for practice on Sunday. During the drivers meeting, all the drivers, crew and families sang “Happy Birthday” to him, and we served birthday cake later that day. The racing brought more bump drafting and very fierce racing between the same three drivers. Jason managed to make a really cool 2 kart pass in the front straight but was not able to make it stick in turn one. He settled for third place all day. Not the best ending to a birthday but he worked very hard and showed some determined spirit and skill. I was impressed by the trust of his drafting partners in each other. These drivers will meet again at the first race of the 206 Cup at Road America, next weekend. We will be using Jason’s favorite sticky tires and the weather is expected to be much better. This time I will make sure to check my notes carefully and check my work before packing up the trailer for the weekend. Even so, there will be some guess work for the Animal kart which will be running a new configuration in an experimental class. Thanks as always to my lovely wife Karen. We could not do this without you and without your very generous permission. Thanks to Katie and my parents to taking the time from other things to hang out with us enjoying the racing and celebrating Jason’s birthday. Happy Birthday Jason!! Once again a huge thanks the Robert and Marty Murray for helping us improve our skill set and getting us back on the track quickly. Thanks to our 2016 Sponsors for their continuing support.